In November I got a membership at San Jose Community Fitness Center. Since I started I have been mostly been using the elliptical machine. To keep up my workout music is a very important tool. 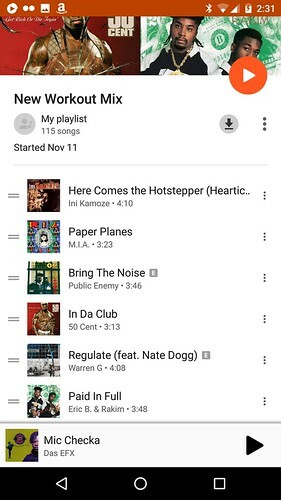 When I got my current phone, I signed up for Google Play Music. I guess the three free month promotion paid off. My gym has free wifi, this is perfect for Google Play Music. I don't have to worry about using my data. I like having an access to just about any song I want to hear during my work out (Sorry, no Prince). 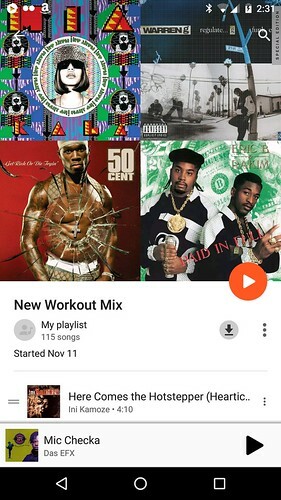 I add some songs before my workout and some songs when I am working out. Here is the thing about music and the workout. I find I need to listen to music I like. They have to be songs I know and can sing along to. It is more than just the beat. Often the words are what get my hyped to go harder. The right music keeps me on the elliptical longer. It does an odd mix of making me think less about being on the elliptical and makes me think more about being on the elliptical at the same time. Let me know about what music I should add to my workout playlist.